When Shane & I used to frequent Ports Cafe, I’d almost always order the winter night salad. It combines crisp romaine lettuce; sweet but tart apples; salty, tangy blue cheese; and a few other goodies to create a delectable salad. I hadn’t had it in over a year (we’ve been distracted by this place, this place, this place, this place, and many of these places) but the salad was very easy to recreate for dinner last night. It’s just as good as I remembered — just as tasty, just as filling, just as satisfying. If you’re feeling a bit ambitious, complement the salad with a slice of good bread brushed with a bit of pesto and topped with Parmesan, broiled until the cheese melts a bit. The piquancy of the pesto and parm pairs well with the salad. 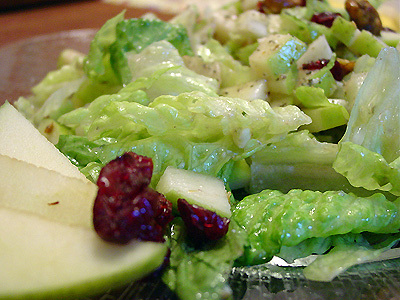 In a medium-sized bowl, toss lettuce and apples with raspberry vinaigrette to taste. Add blue cheese, cranberries onion and walnuts; toss again and adjust flavors as needed. Plate and top with fresh-ground pepper; serve with bread. Yield: 1 large dinner salad or 2 appetizer servings .